I have found that training myself to being in a state of inspiration allows me and the clients I have worked with be in a state of flow where things that I desire happen easily and effortlessly. How does being in a state of inspiration allow more good to flow in? I realized recently that the words “inspiration” and “motivation” each come from unique reference points. Motivation implies the need to take action, whereas inspiration comes from a place of being that energizes us or opens us to the possibility of action. The dictionary describes motivation as “the process that initiates goal-oriented action.” Inspiration is “to affect, guide or arouse by divine influence.” One word is associated with the mind, and one is more associated with the heart. We are motivated by thinking about different thoughts, and we are inspired when we receive information and feel it. The best practice I have found for following my own inspiration is sitting in silence and counting my breaths or using a mantra or focusing on a thought that has no charge for me. Just 10-20 minutes a day makes an impact on your brain and nervous system, and how you are experiencing being in a state of flow where your day just lines up effortlessly. Allow the time and space for your brain to quiet and to focus on something you have no resistance to, like the birds chirping or the hum of the heater or counting your breaths (a neutral thought); this allows the resistance (thinking) in the mind to quiet down. Once your brainwaves are in this state, you allow for inspiration to flow, and you will know when you are receiving information that is not from the mind. In this space, you are not thinking; you are relaxed in your body and mind. You actually create the space to relax inside your nervous system and brain so it can receive. One of the first places stress attacks is our nervous system. When our nervous system is strong, nothing bothers you. Your intuitive sense is expanded, and your mind is clear and decisive. When the nervous system is weak, which stress creates, we are more easily impacted by negative experiences and people. This puts you in a constant state of stress and negativity. Stress is resistance and stops the flow of good. A regular practice of silent meditation time starts rewiring the frontal lobe of the brain (known as the orchestra director for the entire nervous system). When the brain and nervous system start relaxing, you can receive insights and your intuition kicks in. The key then is to follow this insight and see where it leads you and not figure it out with your thinking. Take action on the insights you are given, and let the inspiration take the lead. 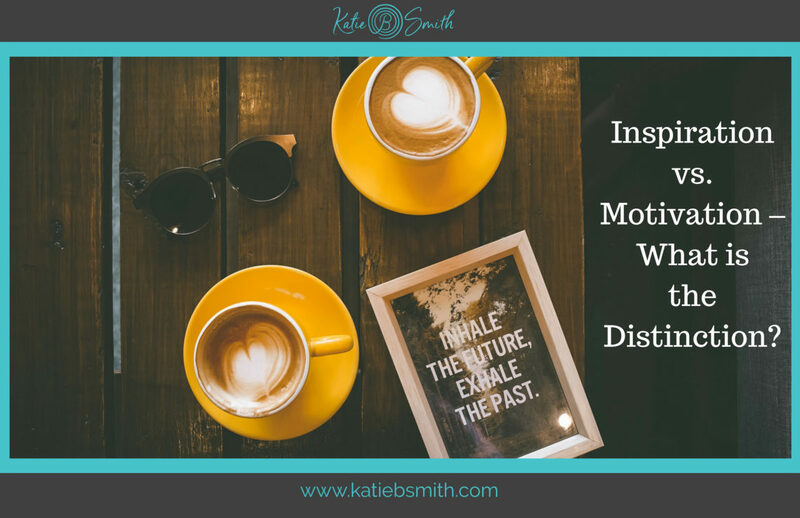 What if we began to use the word inspiration in place of motivation in our lives? How would we live differently if our actions came from being inspired? I ask these questions because in my experience of working with clients, many of them are driven by motivation, but few of them even consider what inspires them. Being inspired is effortless. It is experiencing the flow of the moment and responding to a message you are receiving from something bigger than yourself. It is energizing and uplifting and keeps you connected to the flow of what you desire to create. My clients and I have found that many times the outcome is greater than what we imagined. In training ourselves to be in a state of inspiration, we then are able to experience more flow and build our confidence in trusting our intuitive guidance. There are many ways to train your body and brain to be in a state of no resistance. Daily silent meditation – start small (3 min) and grow the time up to 20 minutes a day. Doing things that keep you relaxed, that “de-stress” you and are healthy and fun. Yoga or other body/mind practices. Anything that moves you out of thinking and keeps you relaxed. Going to the Tonic Bar (if you live in the area) – they have healthy elixirs that relax the body/mind. Remember there is no such thing as being too relaxed. Click here for a downloadable meditation to help you get started with an inspiration practice.